Search Engine Optimization, or SEO, is more like a technique for websites to become highly searchable with the goal of coming up on the top of the results on the search engine. Most people tend to look only on the first page of the result of what they have searched on a search engine. Some people don’t even look at the list of results displayed but just click on the first website on the list. 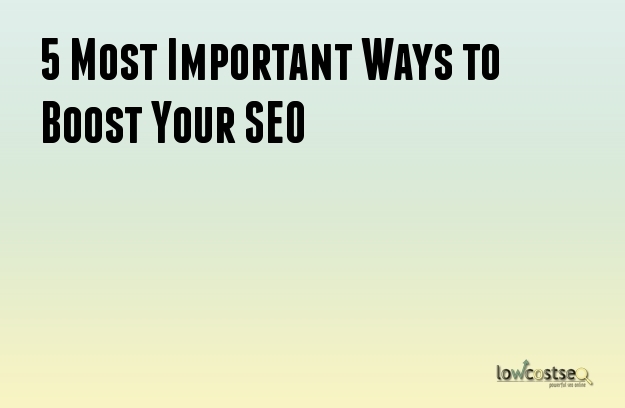 That is how important it is to have a highly effective SEO. If you want to be prioritized, then you have to come first. 1. Make a blog title that stands out. You don’t need a flashy one that almost sounds like you are trying to cajole someone. It works for some people but not for most people. If you set an expectation that’s too high using your blog title but your content doesn’t really make a good impression, the reader would most likely lose interest and never go back to your site again. Remember, don’t make promises you can’t keep, and that’s the same with setting expectations. So, what makes a blog title stand out? Keep it simple and use the necessary words. Put yourself in your imaginary future client or customer’s shoes. Imagine that you want to search something related to your topic. What are the keywords you will type in the search box? What kind of title will catch your attention? That’s how you make a blog title that stands out. It should be something that catches the searcher’s attention. Also, it is not your minute-long introduction. Simple will do. 2. A URL that fits. Don’t make an obscure URL. Make it simple just like your title. Use only the keywords. A human brain can only process minimal series of words so make sure you just get the keyword and don’t add too many words. This isn’t the title of your blog, so make it a lot simpler. Try to think of yourself and those instances wherein you are searching for something online. Do you get the impression that the site using a longer URL is more reliable, or is it the one with the shorter URL that does that? Another thing is, if the site’s URL is easy to remember because of its association with the topic of the content, you will most probably just go back to that site in case you need something else on the same topic. 3. Keep your content updated. This is most likely a guilty sin of a lot of websites especially companies, and even individuals. Most of them just post their contents soon after they built it with the hopes that their websites can stand by itself and advertise for them as it is. That is wrong. You have to remember that every day, there are new websites coming in which is on the same field as yours and you might not want to get left behind and kept under the shadows of those with fresher contents than yours. Even you, as an internet user would be likely to read about something newer or use a website that stays updated because it is also a sign for you to know that the website is active. 4. Set your target market. You have to define your target market. Concentrating on fishing on just a smaller area of a big lake will guarantee you to catch more fish than aimlessly targeting uncertain points. That’s the same with the online market. Analyse the area where you want to be noticed and focus there. It can be defined in terms of serviceable land area, or target age bracket. That’s almost synonymous with getting shared in social media. Hitting your right target will also encourage your target market to share with you online because you are set to cater the needs of that market. This is so far one of the most essential yet misunderstood things about SEO. Search Engines have already bypassed the era where words count, like literally count. There were a lot of contents then that just took advantage of making sure that their keyword is all over their content because search engines used to show results based on how many times the keyword is present on the content. It’s not like that anymore. It’s now based on quality and how related the content is with the title and the keywords. It’s also one of the foundations of getting searched. Additional effective contents, which are actually highly effective ones, are visual designs. They really make the content stand out and pleasing to the eyes.